A few days after the iPad release was announced this past January, an Epocrates survey revealed that 9 percent of physician respondents planned to buy one as soon as it became available in April, and another 13 percent planned to get it within a year. I've been downloading and exploring new applications (“apps”) for mine over the past six months, but these announcements in the past week led me to predict that this and other new generation electronic tablets may become the killer gadgets for neurologists: My electronic health record (EHR) vendor revealed that it has released an OnCall App that will allow me to review my patient charts remotely; Apple publicized the release of version 4.2 which includes a printer app; and the Center for Medicare and Medicaid Services announced that it intends to apply a 1 percent penalty for those who don't use electronic prescribing (eRx) for at least 10 encounters during the first six months of 2011. This regulation, applied sooner than had been previously forecasted, is causing physicians who have not begun prescribing electronically to scramble to find a solution. And because the mobile platform is ideal for writing prescriptions — and it's sized to fit in a white coat pocket — several vendors have recently developed apps for their eRxproducts. Although it's unclear how many doctors have actually purchased the new tablets, quite a few neurologists report that they have begun to use them in practice. Neurology Today asked several for their reviews, and to describe how they are starting to use it for patient care. Robert J. Varipapa, MD, a general neurologist who has been practicing in a small multispecialty group in Dover, DE, for the past 25 years, uses his iPad to access and enter information into their current office EHR. Many EHR systems work similarly, he explained, so ‘Windows Compatibility’ is usually not an issue. He uses his tablet to view his hospital and office EHRs, which are both browser-based, as well as to access his office PACS (radiology system). “It would be nice if the hospital allowed access to their PACS, as I like to show patients MRIs and other radiological studies when discussing their status,” he said. “My favorite inpatient use is to review labs and radiology reports, medications, orders, etc. at the patient's bedside, or when I'm outside the hospital,” he continued. The “instant on” feature, high resolution screen, and long battery life (over 10 hours), make it ideal to access information on the go, he explained. Baton Rouge neurologist Steven J. Zuckerman, MD, also accesses his EHR, athenaClinicals, remotely by using an app to log into his work PC. Getting onto the remote operating room also allows him to access intraoperative monitoring when he's out of the office, and he brings his iPad everywhere. “If they start a case, I'm able to monitor it,” he said. Neurologist Randall S. Hawkins, MD, chief information officer at Sharp Rees-Stealy Medical Group, a large multispecialty group in San Diego, calls slate computers like the tablet PC and the iPad the Holy Grail for physicians. “We can now walk around with an object the size of a clipboard and manage an entire case from anywhere,” he said, adding that it has replaced his computer when he travels. He uses a Citrix Receiver app to access his electronic health record, Allscripts, and said it works better on the iPad than the Citrix Web plug-in does in Internet Explorer. He's able to log in faster than possible from his desktop and look up information while he is heading to see the patient. When a friend recently asked him to see her aunt who had had a seizure, he was able to log into the ambulatory system from home and from the hospital, review the old chart, order a phenytoin level, and send a note to the primary care doctor, all within minutes and from home. Several neurologists said that they use the free Epocrates app to look up medications on their iPhone or iPad, although the drug reference tool does not do electronic prescribing. Several apps, including Rx-writer, iPrescribe, allow for electronic prescription writing. Beachwood, OH, solo neurologist Peter A. Cutri, DO, has looked at several evaluation and management coding apps for mobile platforms. “Stat E&M Coder is very useful to teach yourself how to code,” he said. Although after eight years of practice and several coding courses, he is comfortable with coding, he turns to Stat E&M for those situations when he is not absolutely certain. Dr. Cutri also uses Evernote—a note-keeping application that can type text, clip Web pages, grab screenshots and photos—to track billing and record which patients he needs to see and their locations. He writes brief sentences about patients to help him remember them and updates it nightly before he e-mails it to his secretary. He also uses Jotnot Scanner on his iPhone to record images of his demographic sheets and of handwritten resident consults. Dr. Cutri uses an exchange server to track and synchronize his office schedule, e-mail, and contacts. He can view it in Outlook on his PC, and on a calendar program on his iPad and iPhone. When his secretary makes a change on his calendar —for example, changing his start time — he's able to see it instantly on his iPhone. AAN Medical Economics and Management Chair Neil A. Busis, MD, uses his iPad most frequently for reading and preparing for presentations and participating or running committee meetings. He stores his files using Apple's MobileMe iDisk, and reads them using ReaddleDocs or GoodReader. For light editing of Microsoft Office documents he uses Documents To Go or Quick-office Connect. He edits Apple iWork documents using Pages and Keynote. Dr. Varipapa describes Radiopaedia Vol 1: Brain as a “fun MRI educational program” he likes to use, and iManage Migraine — as a “wonderful patient resource that's free from Merck.” He also likes 3D Brain, “a nice patient resource for pathologic correlation.” Dr. Zuckerman uses neurology i-pocketcards to show patients pictures of the brain and other images, and Neuro Toolkit for the stroke and coma scales and in the treatment of status epilepticus. Several neurologists cited MedCalc, a site that helps medical professionals do calculations and process algorithms and scores. MedCalc (and most of the iPad apps) is available for the iPhone as well. Baton Rouge neurologist, Jon D. Olson, MD, uses it on his iPhone to help him with body surface area calculation to calculate dosage of chemotherapy for glioblastoma patients. He also can access various stroke risk scales, including the NIH Stroke Scale. He is waiting to get an EHR before deciding whether to purchase an iPad. Additional MedCalc apps include: CSF WBC correction for red blood cells, Glasgow coma scale/score, Hunt and Hess classification of subarachnoid hemorrhage, Intracerebral hemorrhage score, Phenytoin/Dilantin correction for albumin or renal failure, and San Francisco syncope rule to predict serious outcomes. Dr. Avitzur, a neurologist in private practice in Tarrytown, NY, holds academic appointments at Yale University School of Medicine and New York Medical College. She is an associate editor of Neurology Today; the editor-in-chief of the AAN Web site, AAN.com, and chair of the AAN Practice Management and Technology Subcommittee. 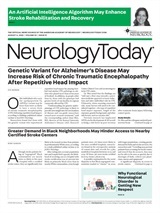 Neurology Today10(24):22-24, December 16, 2010.